ALL MEALS MUST BE PURCHASED BY MAY 15. Eat lunch in the cafeteria with your new friends - a super convenient option! Pitzer Cafeteria prides themselves are sourcing as much local produce as possible - in fact much of it is grown by Pitzer College. PLEASE NOTE: Walk-in meals are NOT available in the cafeteria. ALL DORMITORY RESERVATIONS MUST BE BOOKED BY MAY 15. 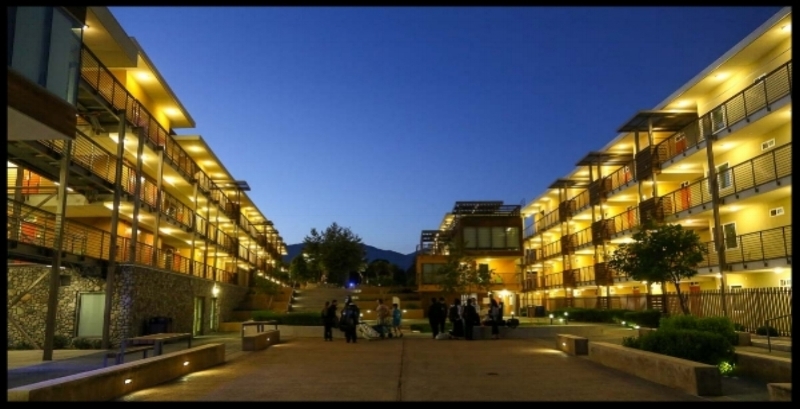 The dormitory at Pitzer College was built in 2012 and is fully air conditioned. A Suite is two double-occupancy rooms that share a bathroom. The dormitory has a large demonstration kitchen, numerous study rooms and lounges are spread throughout the complex, along with decks, balconies and other outdoor spaces for informal gathering. No pets are allowed in the residence halls. Demo Kitchen is a communal kitchen available for participants to use. Please follow posted signage in kitchen regarding labelling your belongings. Please note that area hotels book up quickly so reserve early to ensure a spot! Please note that the dorm usually fills completely - so we recommend reserving your room early. All dormitory reservations and meal plans must be purchased by MAY 15. A description of the on campus dormitory accommodations can be found here. Prices are per room and include tax. 5 nights Single Room, check-in June 16 & check-out June 21: $325 per room. 5 nights Double Room, check-in June 16 & check-out June 21: $520 per room. 5 nights Suite, check-in June 16 & check-out June 21: $1,020 per suite. 8 nights Single Room, check-in June 14 & check-out June 22: $520 per room. 8 nights Double Room, check-in June 14 & check-out June 22: $816 per room. Price is per person per night. Use one form per person. Additional accommodations are available on June 13 and 21. All reservations must be made by MAY 15. Prices are per person and include tax.